After an emphatic win over Argentina in what was tagged as the biggest international friendly in Russia last Tuesday, each player of the Super Eagles will get $2,000. 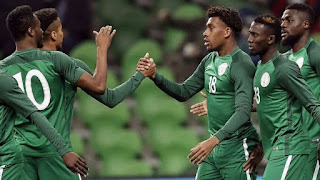 It was gathered that a top Nigeria Football Federation (NFF) executive member who was in Russia, confirmed the cash reward. He said; "The players are entitled to a flat rate of $2,000 for being part of the squad for any international friendly ahead of the World Cup and they are all aware of it".